Rome : Italy's ultra-rightwing League party and France's far-right France's National Rally party could form a "Freedom Front" that would pick joint candidates "for sensitive European posts", League leader Matteo Salvini said on Monday. "We have shared a common project with (Marine) Le Pen for years," Salvini said, referring to the National Rally's party leader. "I believe the 'Freedom Front' will have a joint project for the next 30 years and also joint candidates including for sensitive roles," he said during during a congress held in Rome by Italian labour union UGL, "Economic growth and social perspectives in a Europe of Nations", also attended by Le Pen. "We share the same vision of Europe, agriculture, work and the fight against immigration," Salvini stated. 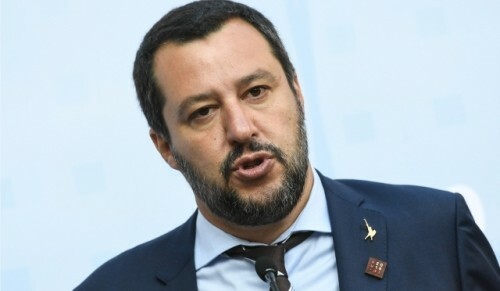 The European Parliament elections on May 25 will be a "revolution for common sense", Salvini claimed, saying that economic growth and social progress "in a Europe of nations" were the priorities. His future vision for the EU was "a community that does a few things well," Salvini said. Italy's League party and France's National Rally party will aim to create "an alternating European Parliament" and will welcome to their alliance "all who share our values," Le Pen said. "We will aim to re-set the EU's values and fight globalisation," she said. Le Pen's National Rally party and Salvini's League party belong to the Europe of Nations and Freedom Group in the European Parliament, which also includes the Freedom Party of Austria (FPO) and the Alternative for Germany party (AfD). The group currently has 35 Euro-MPs.